I was a nine year old with a 110 camera and that’s my Dad just home from work as a psychologist at Richmond State Hospital. Under his arm is a brown bag of beer from Hornak’s Liquor – a little booze shack still in business near the tracks in the warehouse district of town. It’s probably cans of Pabst. 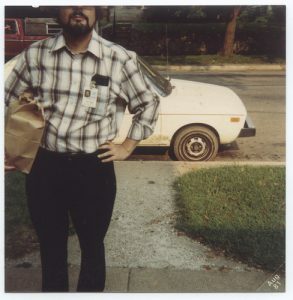 There’s something wonderful about this photo and whenever I think of my Dad, I think of this picture, that sidewalk where I learned to ride a bike (a hideously wonderful bright yellow thing) and that a tree fell on our VW Rabbit right there in that parking space. John Parrish died in 1985 when I was thirteen. I was young and most of the hurt subsided a long time ago, but I still think about him often and would love to know him now that I’m an adult. I’m certain we’d be friends. Thank you for sharing this picture and the story behind it. I love how it seems to be a universal trait that kids cut off people’s heads in photos so that gave me a big smile. I also love that you instantly know that this picture was fueled with love and it flashes me right back to when I was that age taking random photos of friends and family as well. I feel very full when I look at this photo– things long forgotten come back to me and I end up back on the front porch listening to him sing and play guitar. Good times. Very good times. I cannot express how much I love this photo. Fantastic, even without the story behind it. My gran always chopped the heads off people with her 110 camera. I think it was because it was so light that she moved the camera down a little when she pressed the shutter. Or maybe it was art – one or the other! He wore a cowboy hat. We lived in a small city in Indiana, but he wore a cowboy hat because he wanted to, and he didn’t care what anyone thought about it. I bought it for him. We were quite a pair…him with his cowboy hat and me with my big Afro hairstyle! A man full of mischief, super smart, interested in everything. Even after 25 years, a song or the smell of Captain Black pipe tobacco, or a picture as above surprises me with the sharpness of the sense of loss. It will pass, of course, until the next time I get ambushed by it. It’s funny, though, although the episodes are painful, they also bring me the memories I’d love to be in again. One of my favorite pictures of you and John is the one of the two of you on the carnival ride. He always had as much fun as you did! Thanks for the picture and the jolt to my heart. It was familiar and good. I just read my comment from last night, and I am so embarrassed. I tried to express the feelings that the photo gave me and why John was so special. I tried to do it without getting too mushy and personal, but it came out stilted and superficial. I should have just said that he loved his cowboy hat, he was special to me, and I still miss him. I loved your comment Mom. OMG…Jen are you trying to make us cry. The photo is awsome, though probably not as awsome as the man himself. I wish there was some way I could talk to the guy that played such a pivotal role in one of my favorite peoples life. Dunno, maybe it’s a girl thing or just your personality but I doubt I’d have the stones to share such a personal side of myself. Glad to see your happy. Thank you Steve- I can actually see you and my Dad going for a beer. He would’ve liked you.